One of my favorite wintering birds in Arizona is the Snowy Egret (Egretta thula). It seems to be a prototypical example of one of the topics I frequently blog about - the surprisingly vast array of animals that the desert supports. 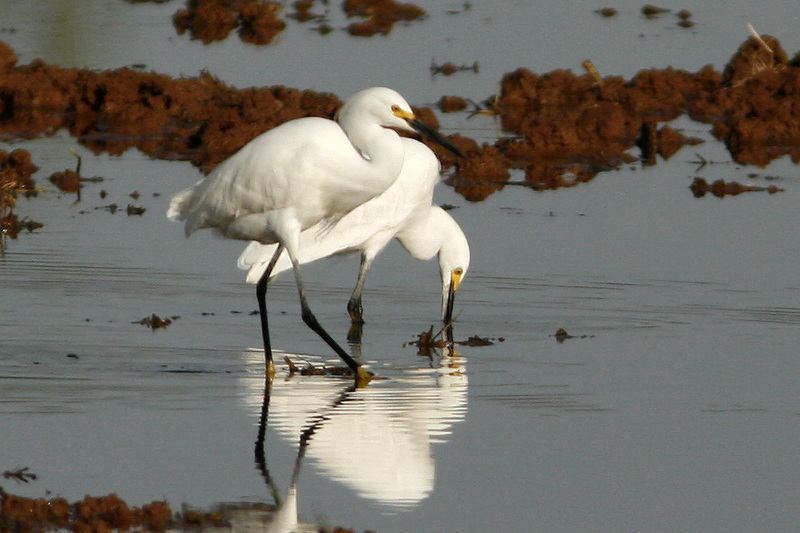 Of course, the easiest places to spot Snowy Egrets are at man-made ponds and recharge basins. But they also will show up as slow running washes, natural ponds and lakes, and other natural waterways. 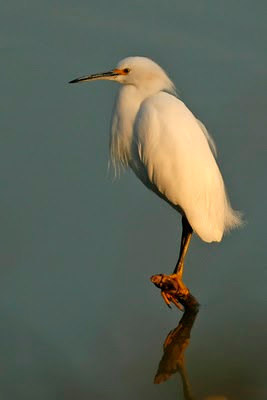 At different times of the year Snowy Egrets can be found through most of the southern half of the USA, making it as far north as Idaho, Nebraska, and Massachusetts on a regular basis, but only regularly winters in California, Arizona, the Gulf Coast, and the southern Atlantic coast. In general, it covers much of the same range as the larger Great Egret and the similar sized Cattle Egret, with the Great Egret's range being slightly larger, and the Cattle Egret's range slightly smaller. Often, the Snowy Egret can be distinguished from Great Egrets by size alone - but if you do not have something of a known size to compare to, this can be difficult. The best distinguishing feature is usually coloration - contrasting yellow and black on the lores and bill, and yellow feet. 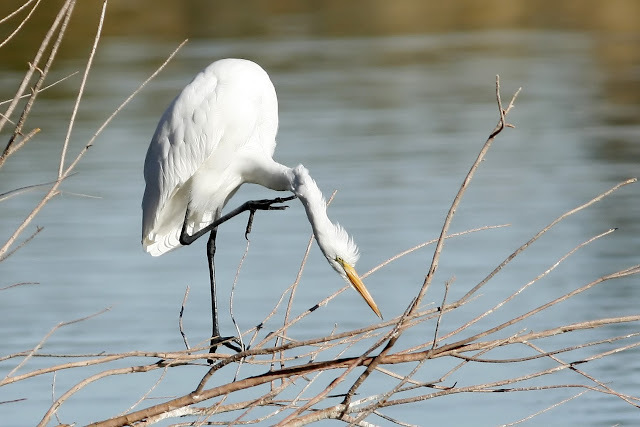 In contrast, the Great Egret has gray/black feet and legs and much less black on the bill. As for distinguishing from the Cattle Egret - once you've seen a Cattle Egret once this should be easy. 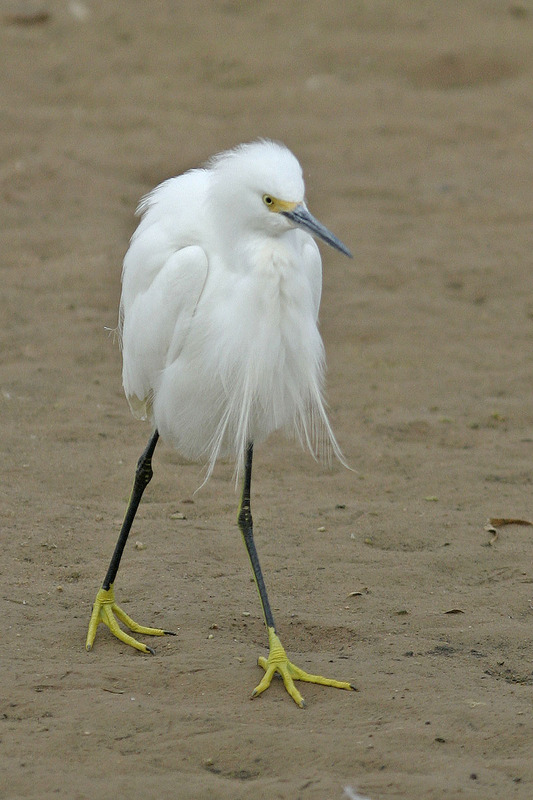 The short bill of the Cattle looks almost comical and disproportionate as compared to that of the Snowy Egret. Thanks very much for the comment. Most the time the Snowy Egret is standing in water, so I too was really amazed at how yellow those feet are. Another bird with interesting feet is the American Coot. Another water bird, its feet look like aquatic vegetation! i like it you know this bird. this bird deferent name for arab is name AL Malik al hazin its mean sad king .